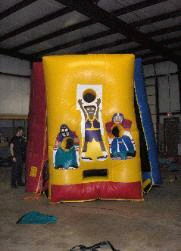 A three-sided 12 feet high entertainment center features up to 8 games. Our new frisbee toss side, the bean bag velcro dart game plus the sports challenge side that includes the football pass, baseball throw, basketball shot, soccer kick and more. * Please call us for any questions on our games galore 3 sided game rentals in Pipersville PA, Hatfield PA, and Bucks & Montgomery Counties in Pennsylvania.